Ask a Korean! : What Makes a Good Korean Restaurant? New blog concept: You tell me your favorite Korean restaurant in your town, and I will visit, eat, and tell you everything that's wrong with the food served there. Inspired by a crappy Korean restaurant in middle America that I'm sitting in. Its walls are covered with awards from local papers, which makes me want to disband those papers. As TK said in a comment to the update, he won't actually do this. He is a lover, not a fighter, and he certainly knows better than to mess with people's livelihood. However, there is still a teachable moment here. Many people--including many Koreans!--do not really know what separates good Korean restaurants from bad ones. These people simply do not have enough experience to form a frame of reference as to what elements good Korean restaurants have. Don't just criticize; show the alternative. So TK will give the alternative. Here is a list of things that you should look for in a Korean restaurant in order to tell if it is a good one. In U.S.: Let's be straight. Korean food is not yet at the place where, say, sushi is--that is to say, Korean food is not yet mainstream enough for one to expect a dependable taste for it, outside of the people who grew up eating it constantly. This necessarily means the ceiling for the quality of Korean food sold in areas sparsely populated by Koreans will be rather low. In the U.S., Koreans mostly live in Southern California, New York/North New Jersey and D.C./Maryland/Northern Virginia. (The next tier of Korean American population centers are Northern California, Atlanta, Chicago and Seattle, but the drop-off is significant after the top three.) The quality of Korean food tends to track that order. In Korea: Korea is surrounded by seas on three sides, with each side producing different types of fish. Korea's terrain also ranges from mountains to fertile and flat fields, each yielding different types of crops. In short, Korean food is highly diverse based on geography. Because everything in Korea tends to eventually flow to Seoul, the restaurants in Seoul tend to maintain a certain level of quality. But for the real deal, look for the restaurants that sell the food that is made from the local ingredients. Freshly made soft tofu from Sokcho. This ended up in TK's stomach within minutes. For example, tofu requires sea water to make. (Bet you did not know that.) Thus, the best tofu comes from Korea's eastern seaboard, in which soy beans grow and the sea water is readily available. Port cities, obviously, are the best places to have fish and seafood. Jeju Island is not only known for its seafood, but also for pork from its native black pigs. Since each locality in Korea loudly advertises its specialty food, it is hard to miss the local delicacy. Two additional points: (1) in the City of Jeonju, every dish is good; (2) in Daegu, every dish is awful. Just trust me on this. Jeonju is the birthplace of bibimbap, one of the most iconic Korean dishes. In Daegu, locals say the best food available is McDonald's. Both in the U.S. and in Korea, this holds true: watch out for restaurants that sell too many different dishes, because every one of the dishes will be mediocre-to-bad. 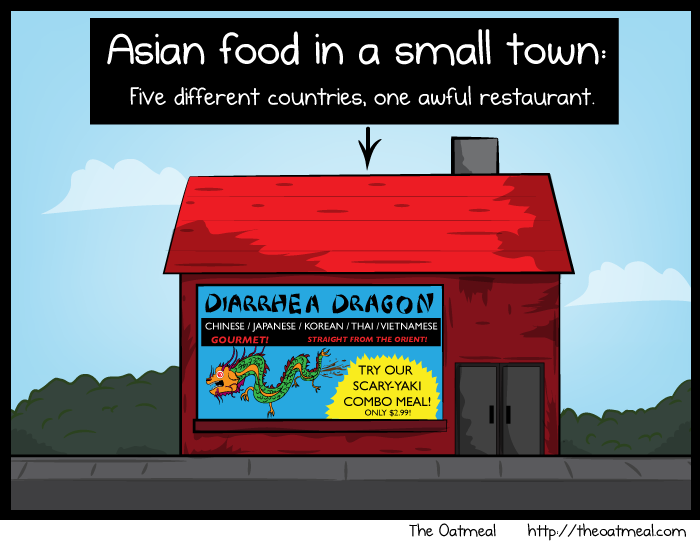 Unfortunately, this applies to vast majority of Korean restaurants in the U.S., because there simply is not enough demand to specialize in certain types of Korean food. In small towns of America, the menu often crosses the border to include Japanese/Chinese/Thai food, creating an unholy alliance of shittiness. Avoid this type of restaurant at all costs. In Korea, restaurants with big menus tend to be in and around train stations and express bus terminals, where many different types of people pass through without particularly caring about the quality of the food available. Avoid these places as well. The good Korean restaurants serve foods that are related to one another. For example, naengmyeon [냉면, cold buckwheat noodles] ought to be sold alongside with suyuk [수육, boiled meat], because naengmyeon's broth is made of meat. (In other words, do not eat naengmyeon at a place that does not also sell suyuk; it means that the restaurant is using canned broth.) Jokbal [족발, braised pig's trotter] is usually sold alongside bossam [보쌈, steamed/boiled pork with kimchi and cabbage] because they are both pork and they both involve boiling/steaming. soft tofu soup, for KRW 8,000 (~$8). A restaurant has to be awfully confident in what it's selling if it intends to make a business by simply selling a single dish. If you see a Korean restaurant with just one item on the menu, stop by and eat. You will not be disappointed. 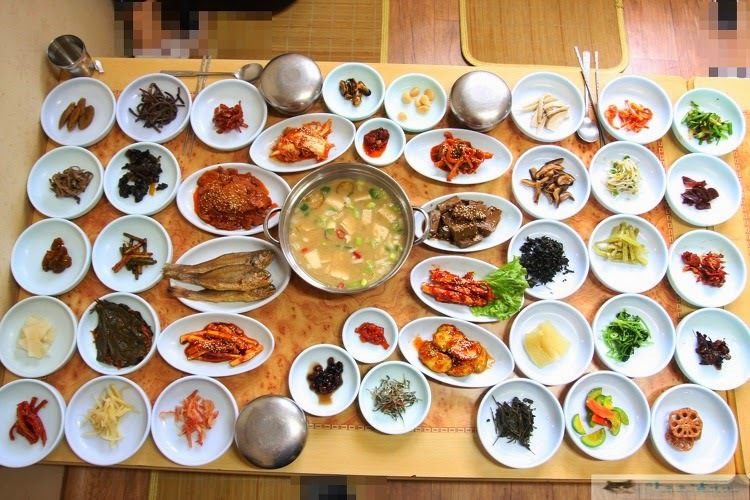 Majority of Korean food will be in some configuration of rice, kimchi, banchan [반찬, side dishes] and the main dish. Because rice, kimchi and banchan will form the backbone of a Korean meal, the way in which a Korean restaurant handles these elements is a great gauge of how good a Korean restaurant is. Kimchi: At this point, there might be a bit too much mystique surrounding kimchi in popular discourse, as if there can be no proper kimchi outside of the kitchen of some old Korean grandmother. Truth is, one can buy pretty decent kimchi from the store--as long as one pays for it. Therefore, kimchi is a decent yardstick to find out whether the restaurant in question has minimum competence. If a restaurant serves bad kimchi, it either does not know what it is doing with food, or does not care enough to buy good food--which includes good ingredients. There are two major ways in which kimchi can be wrong: too sweet, or too sour. If either or both is true with a restaurant kimchi, chances are the food will not be good either. Sweetness is the cancer that is slowly killing Korean cuisine. This cancer is everywhere in Korean food in America, and frequently found in Seoul as well. Gratuitous addition of sugar and MSG (which is also sweet) is ruining the palate of those who did not grow up experiencing the traditional palate. Beyond the subtle sweetness naturally present in the ingredients, Korean food should not be sweet at all. This absolutely applies to kimchi: although napa cabbage and Korean red pepper both bear some natural sweetness, one should be able to tell immediately whether any sweetener was added. Note that napa cabbage, which is the main ingredient for the most common type of kimchi, is a winter vegetable. The best Korean restaurants serve kimchi made with seasonal vegetables, not just with napa cabbage. (More on this below.) At least during the winter, cabbage kimchi ought to have a satisfying crunch when chewed, instead of fiber-y toughness. Good kimchi has a strong hint of seafood; cheap kimchi does not, because seafood and fish sauce can be expensive in large quantities. Rice: If kimchi tends to show the floor of a Korean restaurant's quality, rice tends to show the ceiling. Most restaurant rice is decidedly mediocre, largely because restaurants usually cook rice in one huge batch, which sits for hours in a giant, industrial-sized rice cooker. Some restaurants place rice in a stainless steel rice bowl (pictured below) immediately after the rice cooks, and puts the bowl in a warmer. 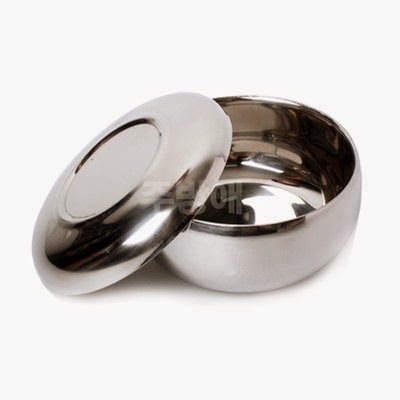 (The bowl has to be made of stainless steel in order to conduct the heat from the warmer--which is why the stainless steel rice bowls are commonly seen in Korean restaurants, but rarely in a Korean home.) Doing this improves the quality of the rice, but only somewhat. The ubiquitous stainless steel rice bowl. The very best Korean restaurants keep numerous small rice cookers, and cook small batches of rice. The rice is served in the traditional porcelain or brass ware--a sign that the rice did not spend any time in the warmer. Good rice is moist enough to have a shiny sheen. Each grain should be intact and visible. One must be able to feel the individual grain when one chews the rice. To reiterate: good rice is pretty difficult to find in a restaurant. It simply takes too much effort to make each bowl of rice perfect. But this means the restaurant that does put in the effort to serve a good bowl of rice cares about the quality of food it puts out. Good kimchi means the minimum standards are kept; good rice means that you can look forward to the maximal quality. Banchan: Kimchi is the minimum; rice is the maximum. Banchan is everything in between. Having a table full of banchan is certainly more impressive than having just two or three. But don't be fooled: restauranteurs also know that big number impresses. They will attempt to impress the customers by having a huge number of banchan that may be old and stale or, worse, buy the banchan from a wholesaler and simply put them on plates. Quantity matters to some degree, but quality matters much more. Good banchan takes effort. Tossed salad and simple pickles (usually in soy sauce) do not take much effort. Cooked or fermented dishes with processed (e.g. dried, smoked) ingredients take significantly more effort and time to make. Good banchan does not disguise the ingredient. Be skeptical if all the banchan is slathered with soy sauce or gochujang [고추장, hot pepper paste]. This may be a sign that the ingredients are old and stale, and their true flavor needs to be hidden. Good banchan is also seasonal. As discussed earlier, napa cabbage is a winter vegetable; ideally, one wants to see kimchi made with yeolmu [열무, radish stem] in the summer. Similarly, certain fish are the best in certain seasons. The most famous example may be jeoneo [전어, hickory shad], which is featured in an Korean old saying: "autumn jeoneo makes the runaway daughter in law to return." The best Korean restaurants will serve different types of banchan each time you visit, depending on the season. Flip these characters around, and you get the idea of what makes a bad banchan. Among the commonly seen banchan, the worst has to be potato salad, because it fails all of the criteria above: potatoes are commonly available everywhere (= not local,) it is usually covered in mayonnaise (doubly offensive on this point, since mayo is not Korean,) it requires very little effort and is definitely not seasonal. In TK's book, any Korean restaurant that serves potato salad as banchan goes down a few notches. Main Dish, and Overall: With any food with broth or reduced sauce (which starts from broth,) taste for MSG. Unfortunately, MSG is very difficult to detect when the food is hot and spicy--like many Korean dishes. The best, and perhaps the only, way to detect MSG is to have a lot of experience eating Korean food that is MSG-free. If any food tastes "too good," suspect MSG. Look for MSG's telltale chemical sweetness that tends to linger in your mouth after swallowing the food. MSG is easier to detect after the food cools down. Monitor if you feel extra thirsty after eating a Korean meal, because that may be a physiological response to MSG for certain people. Watch out if the food has only "one speed." Korean food is about delicately balancing multitudes of flavors. Poorly made Korean food allows one or two flavors--usually spiciness or the savoriness from sesame oil--overpower the rest of the ingredients. Despite its reputation, Korean food should not be overly spicy to the point where no other flavor can be detected. These are just some of the guidelines for discerning good Korean restaurants from bad ones. If you have any additional guidelines, please share in the comments--TK will include the good ones in the main post. Be a judgmental Korean food eater! There is no need to be a jerk at the restaurant as you are eating, but there won't be better Korean food near you until you start caring about its quality and make affirmative choices to support good Korean restaurants. 맛있게 드세요! You're so right about Jeonju. Living there spoiled me, and now that I've moved to Daejeon, everything is just "alright." I agree with everything until, as you may already know, you got to the broccoli. It's been heavily adopted in especially the past five years. Kohlrabi is getting to be part of the cuisine as well. Potatoes, corn, tomatoes. The traditional cuisine I think that's your ideal, I'm finding, only existed in a tiny sliver of time. Before the 1800s, you could say that Napa cabbage had no place on a Korean table. Before the 1700s, you could say that chili peppers, gochujang, and gochugaru were abominal local adoptions of foreign ingredients. I seriously agree about the overuse of sweeteners and MSG with the lazy application of gochujang in banchan. Those are all signs of bad restaurants. And that sign of the 순두부 menu is classic. That should become a meme. care to plug the 순두부 restaurant? i've had it a few times and it wasn't great, so it would be nice to know how it tastes in a place that specializes in it. Imagine the most tofu-ed taste you can have in the U.S. Then you are imagining usual taste of spcialized(and, most of them, also famous) 순두부 place in Korea. There is a Jeonju restaurant in Gangneung, by the Kyeongpo Beach (경포대) where they serve you quite an amount of side dish, with refill, of course, and everything, but I mean EVERYTHING is so tasty there, from what I tried so far. By everything I mean both the main and the side dishes and you're served a little different stuff each time you come, so it's fun and kinda exciting because it's unpredictable what you are going to eat along with what you ordered, but you always know it's gonna taste good. 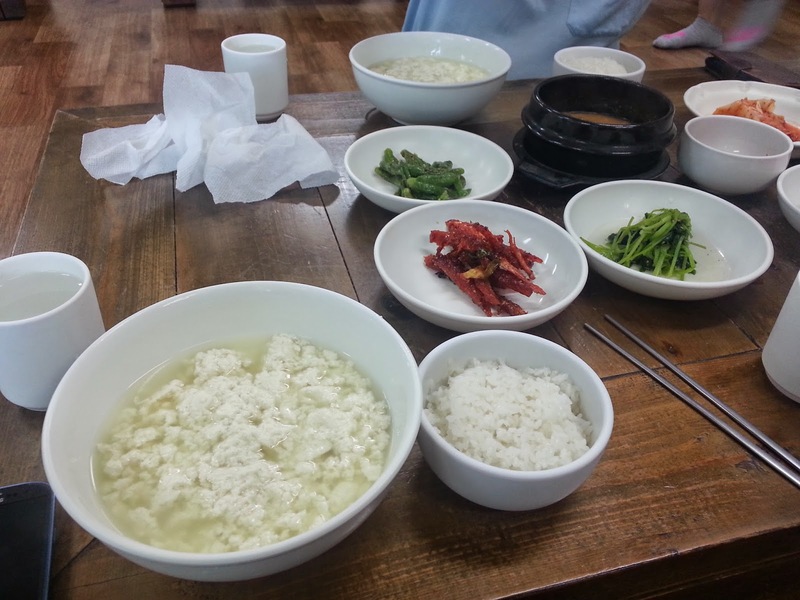 I had a great lunch south of Ulsan with as many side dishes as TK pictured. All the side dishes were fair to very good. All for $5. You can't get that in America, anywhere. Very timely. Last week a friend and I were looking over the local food delivery service's restaurant lists. Most described themselves as a specific ethnicity, and there was a large concentration of "Asian" restaurants. "What does "Asian mean?" I asked in irritation (he is Taiwanese, I eat only Korean food.) "Russian" he promptly replied. We then made up a sample meal from one of these places: sashimi, dosa, borscht, pho, biryani, bibimbap (I suspect that the SF Bay area is home to some of the worst abominations calling themselves bibimbap imaginable), Hakka salt chicken, dim sum, hot pot (doesn't matter what kind, right? ), all served with fresh kimchi made yesterday - or not. Of course, with 49 countries listed as Asian in Wikipedia, we left out a lot. Between my apartment in Silicon Valley and the Korean market (1 mile) there are restaurants of about 10 different regionalities, including 3 different kinds of Indian food. Asian restaurants = not American, and we used soy sauce. What's your take on the brown rice? Is it customary that in Korean cuisine, brown rice has to be cooked with some kind of beans that give off a sweet flavor? I've been trending away from white rice in recent years in favor of brown rice lately. When it comes to Korean food, brown rice simply isn't plain or prepared in the way I expect it to be, based on seeing how others prepare it. It bugs me.
" Foreign vegetables--like broccoli--have no place on a Korean table. (Don't argue with me about how broccoli might be local to the U.S. It's not Korean. End of discussion.)" Thankfully, restaurateurs, cooks, and home chefs 500 years ago thought otherwise and were willing to use foriegn ingredients. Without that willingness to innovate, traditionally "Korean" ingredients like the chili pepper and squash would have never made it onto a Korean dinner table. Let's talk about broccoli(including another not-korean-ingredients which are darn common in U.S.) about 400 years later. I, as a korean, accpeted chilli pepper(especially one in the powder form, red colored) now. I just cannot agree with you anymore, except one thing, about Daegu. Almost every born-and-raised seoulites are prefer 전라도 for the land of taste in Korea, but you may have just worse image for 경상북도 and less experience. And 경상도 people, maybe, just not have the tendency of gourmet. So they just did not imagine the chance to show you what they feel delicious and recommend them. Sweetness is not only a cancer on Korean food, but on all food. Tastes other than sweet deepens the food's flavor, and widens the palate, and in extension the mind and spirit. Being able to tolerate and like certain tastes, like the bitterness of olives and ginseng candy or the sourness of a Middle Eastern yogurt drink, tells me much about the person, such as the quality of mind. Usually one who likes mostly sweet things, in my experience, have a simple dualistic mind of simply good or bad, not to be antagonistic to anyone here. I don't think one ought judge someone's mindset based upon their preference in food, even if I too would reckon a similar correlation. Indeed, the incessant sweetness in most food I find these days is disturbing. My girlfriend recently complained that the only flavors she can find in Seoul these days are sweet, spicy, and bland. For my part the worst abomination by far has been wrought on Italian cuisine. Sugared garlic bread is just vile, and I'm pretty damn sure I've had a few pasta dishes where gochujang was used to make the marinara sauce. 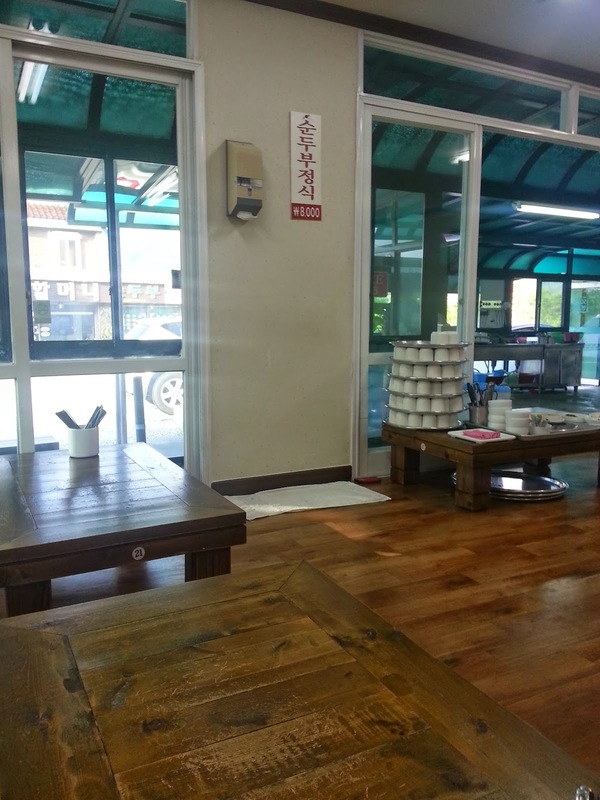 There's a restaurant in Yeonsandong, Busan off the circle, north called Hamjeong that makes the best sweetened desserts. The caramelised potatos, goguma mattang, there are fantastic. If anyone can recommend a decent place to get haejangguk in the Seattle/Tacoma area, I would be eternally grateful. For some reason it's difficult to find congealed blood soup in the U.S. I can't imagine why. "Many people--including many Koreans!--do not really know what separates good Korean restaurants from bad ones." The problem is deeper. Most people don't know the difference between good food and bad. The ingredients contained in the foods we buy, particularly the most fundamental ingredients like fermented soybean paste, gochujang, and soy sauce, reflect our collective indifference and tolerance for garbage. "If you have any additional guidelines, please share in the comments"
The most important ingredient is sincerity. The cook/chef and owners must sincerely care about the quality of the food they produce. Everything follows from this. The rule also applies to home cooks. Do you care about what you produce or just slapping something together from garbage ingredients in some half-donkey manner to fill up oversized bellies? Cooking isn't that hard. If you think that you're a bad cook, the blame is not in your skills or the deftness of your hands. "Be a judgmental Korean food eater!" Whether it's home cooked meals, Korean food or something else, care and quality are reflected in the food. We can disagree about style, presentation and flavor, but sincerity is nonnegotiable. And that's the trouble with most restaurants today: patrons don't know or don't care and owners sometimes know but don't care because it is not rewarded. fermented soybean paste, gochujang, and soy sauce, reflect our collective indifference and tolerance for garbage. I like them all. Don't think they are garbage either. They are communal rites, rituals at every meal. Any Korean that dislikes kimchi, gochuchang, kakdugi, sam-bap, in my book, has lost part of his soul. Most of what's sold is garbage because the ersatz ingredients that go into them are junk. And the Korean Ministry of Food Propaganda should be ashamed that while they like to brag on about the wholesomeness of traditional Korean food, the ingredients that go into foods today tell a very different story. This one is great. Makoli is a traditional Korean alcohol believed to be healthier, but who knew that aspartame was invented in the Chosun dynasty? Do you have link for Chosun invention? Because if true that would be cool. can suffer allergic reactions from hyaluronidase in soy sauce. People react differently to foods. I'm just saying, I've never had problems with Korean foods, but I'm sure there are Koreans who can react badly to them and all the new chemicals added to them recently. "Do you have link for Chosun invention? Because if true that would be cool." No, I don't have a link because it's not true. And it wouldn't be cool. "They use food dyes and preservatives that are illegal in the US." Nothing great about the US either, but at least we know that. No one eats ketchup presuming it's good for you. "Soybean paste is considered to be a healthy"
Of course. But, most soybean paste sold over the counter contain fillers, like flour. Most gochujang sold do not appear to contain fermented soybeans but a cheap mixture of wheat, sugar, hot pepper and rice flour. Personally, I have not been able to locate any gochujang made with fermented beans and without wheat flour. Most soy sauce contain wheat as well. Worse, many also have preservatives, sugars, food coloring or other garbage. Needless to say, prepared in traditional fashion, all 3 are good for you. A big problem with Korean restaurants (in Korea) these days is that many are run by retired people who have no prior experience with food. It's just a way for them to keep working after retiring from their careers. This is particularly common with grill, dalkgalbi, and shabu shabu restaurants. If you want a good grilled meat restaurant, find an independent one run by a younger(ish) Korean. Food will be their passion, not just their post-retirement income. Younger restauranteurs also seem to be more discerning with ingredients and more willing to stray from the mainstream when it comes to food. Younger restauranteurs who are betting their livelihood on food service know they need to serve excellent food to stand out from the crowd. And they are usually much friendlier too! Great write up TK! I love your observations on Korean food -from this post to your praises of 단고기 (dog meat)! One thing that I noticed about Korean American food is the abuse of meat in dishes. Meat, especially beef, is quite expensive in Asia (Korea) so skilled chefs had to learn various techniques to make their foods savory and hearty using a minimum of meat. However, since cheap meat is so easily accessible, many Korean American restaurants load up their dishes with meat, because that makes the food "luxurious." For instance, I had a bowl of 곰탕 at an allegedly famous Korean restaurant in K-Town, and it was wretched. It was filled to the brim with oxtail, but the meat wasn't treated with care at all. A good bowl of oxtail soup is either pressure cooked or slowly boiled, turning all of the tough connective tissue into a delicious unctuous liquid. The meat is incredible moist and tender. However, my 곰탕 (oxtail soup) was quick boiled, and all the connective tissue turned to rubber. Essentially, I was served a heaping bowl of gristle in a watery broth. My K-Town friends exclaimed, "Look at all that meat! You never get that much meat in Seoul!" I had to choke it all down, of course, because my friends and I still hung on to the idea that meat is expensive and throwing it away is a waste. One complaint I have about Korean food is their use of fish. Of course, this probably represents regional prejudices (I didn't grow up eating seafood), but typically, all over the world, cultures try to use ingredients to neutralize strong fishy tastes and odors. In India they use yogurt, in the American South they use buttermilk, in Europe they use lemon, in China, they use ginger. However, Korean seafood seems to revel in fishy tastes and smells. A Korean favorite, 고등어 (mackerel) is typically prepared in a way that will make a whole block stink like fish. Dried squid is powerfully fishy. And I have never tasted 홍어 (skate) that I like. Unfortunately, this love of strong fishy flavors often ruins some kimchi for me. My favorite kimchi is not fishy at all, but has an almost fruity note (perhaps some 배 or Asian pear is used) and an almost carbonated feel while eating due to fermentation. TK's suggestions about specialized restaurants, and related menu items is gold. Before I left Seoul, I went searching for the best bowl of 공국수 (cold noodle in soybean broth) that I could find. I eventually found a restaurant that offered it for the outlandish price of 9,000 won. When it came out, I had one bowl of cold noodles, and one bowl of kimchi. Nothing else. I felt robbed, and told myself that this better be the best kimchi and 공국수 (cold noodle in soybean broth) I ever had for this price. To my surprise, it was. Other terrific bowls of 공국수 (cold noodle in soybean broth) that I had included peanuts, walnuts, and seasame seeds as part of the soybean broth, giving it a delicious nutty flavor. However, this broth was just all soybeans, and it was nutty, deep, complex, and delicious all on its own. The kimchi was just how I like it (as I described above). Simple, perfect. One area where I think that Korean food can grow and develop is its use of traditional medicinal herbs. I've had killer bowls of 삼계탕 (chicken and ginseng soup), and 백숙 (chicken and medicinal herb soup) that an unbelievable, indescribable, quality different from anything I have tasted before. I've tried to cook with some of these ingredients myself (황기 and 옻나무 come to mind), but I was clearly an amateur with no idea of what he was doing. TK, I'd love to see and hear more about Korean food on this blog. In particular, I'd be interested in hearing about specialized local cuisine (I'd love to hear more about the tofu making process) and your best eating experiences. Is there any good naengmyun in the DC/NoVA/MoCo area? The only restaurants that seem to serve it are either mediocre Korean BBQ places or the joints with the too-big-menus that you decry in your post. I literally think the best bibim naengmyun in the area is H-Mart and forget about mul naengmyun. Any suggestions?